Ureca is nestled in an unspoiled natural paradise on the coast of Bioko Island. The town has the dubious honour of being the rainiest place in Africa, but the stunning black sandy beaches and pristine rainforest make Ureca an exciting and beautiful place to visit. 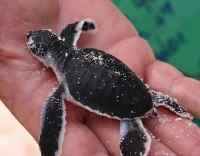 Bioko Island is an important nesting site for sea turtles and Ureca is possibly the best place to witness the miracle that is hatching season. The coast is the nesting ground for four different species of turtle: leatherback turtles, green turtles, Olive Ridley turtles and hawksbill turtles. Nesting season is between October and April.